When we continue the story in Luke 7 we read about a woman who lived a "sinful life" -- generally interpreted as a prostitute -- who gatecrashed Simon's dinner for Jesus. You can already picture the scene -- a dinner is held in honor of a rabbi and this woman with a reputation enters uninvited. This is the last person you would expect at a Pharisee's dinner held in honor for a rabbi. But here she is entering, not caring about any whispers directed against her, heading straight to Jesus. What was her motivation? Perhaps she heard Jesus preach and thought to herself that maybe she had a chance at new life. Maybe this man preaching forgiveness really was the Son of God and the Messiah who can change everything for her. If so, then nothing can be more valuable than knowing this man who claims to forgive sins and give a "new birth". The woman breaks her alabaster jar of perfume (perhaps used for her occupation), cried and kissed the feet of Jesus, and wiped his feet with her own hair -- doing the very things that Simon failed to do. Simon, instead of learning his mistake from the woman's actions said, "If this man were a prophet, he would know who is touching him and what kind of woman she is -- that she is a sinner". Clearly Simon didn't really think Jesus was a prophet, much less the Messiah; perhaps he only had a dinner with Jesus because of his popularity or perhaps to investigate him more closely. Jesus notes the correct response of Simon. Jesus declares to him that the woman's sins "have been forgiven -- as her great love has shown. But whoever has been forgiven little loves little". The actions of the woman showed how much value she placed on Jesus. Simon's lack of devotion, on the other hand, showed how much he really though Jesus did for him. Q3: How much do you really think Jesus did for you, and is that reflected on your devotion to him? The more valuable we think something or someone is, the more importance, care and devotion we place upon this thing or person. This is true for cellphones, friendships, and for our relationship with God. If we think that God didn't really do anything for us (we're "good enough" without Jesus anyway), this will be reflected in our actions towards God. On the other hand, if we find God to be our greatest treasure and the source of our greatest joy then this will be reflected in our devotion and love for God, too. To conclude, which of these three characters are you most similar to: Nicodemus, Simon, or Mary? While we might start off as "secret followers" of Jesus like Nicodemus and Joseph of Arimathea, God wants to lead us to a closer walk with him until we can truly be unashamed followers of Jesus like the woman. Traditionally, the "sinful woman" is identified as Mary Magdalene. If this is true, then such was the devotion of Mary that she was one of the few people who was with Jesus up until his death. In Romans 1:16 Paul himself says, "For I am not ashamed of the gospel, because it is the power of God that brings salvation to everyone who believes: first to the Jew, then to the Gentile". May we live according to the truth of this passage. 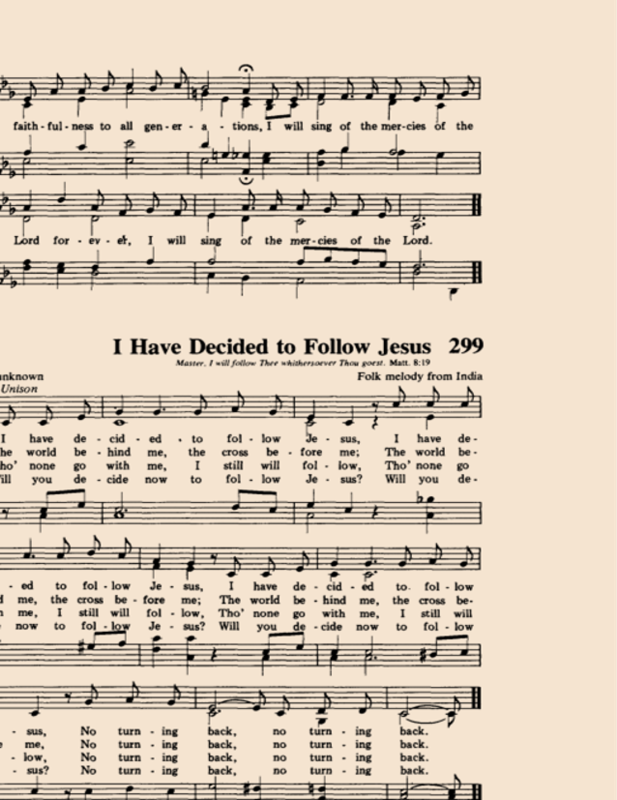 The lyrics are based on the last words of a man in Assam, north-east India, who along with his family was converted to Christianity in the middle of the 19th century through the efforts of a Welsh missionary. The story was later passed on to an Indian missionary, Sadhu Sundar Singh, who is attributed with the formation of the words into a hymn. The melody of the hymn is also of Indian origin.